“I did not find the spirit of the evening to be offensive or blasphemous at all,” said the cardinal. ‘“Flesh-flashing” outfits adorned with Christian symbols’ — evangelization of culture? “To take those symbols, hard won by the generations of artists and thinkers who built up Christendom on the foundations of the pagan world and reduce them to accesories to surgically-augmented body parts” — that’s not blasphemous? Not offensive? The very word “imagination” in today’s predominantly secular world suggests a creation of the mind, an idealized poetic creation that has nothing to do with faith. The Catholic imagination only really exists where it expresses, affirms, conforms to sacramental reality and dogmatic truth. Maybe someday the celebrities that disgraced themselves at the Gala will come to understand the difference between Catholic imagination and its counterfeit. What’s far more important is that people who should know the difference — permit, and promote the secularization of the Church. Those who should be in the forefront of fighting for the Church and her values — choose instead to appease Hollywood elite. Sixty five years later we are still in dire need of light. Enjoyed the post? Share it with others, like it — thank you . Image: Gerard David. 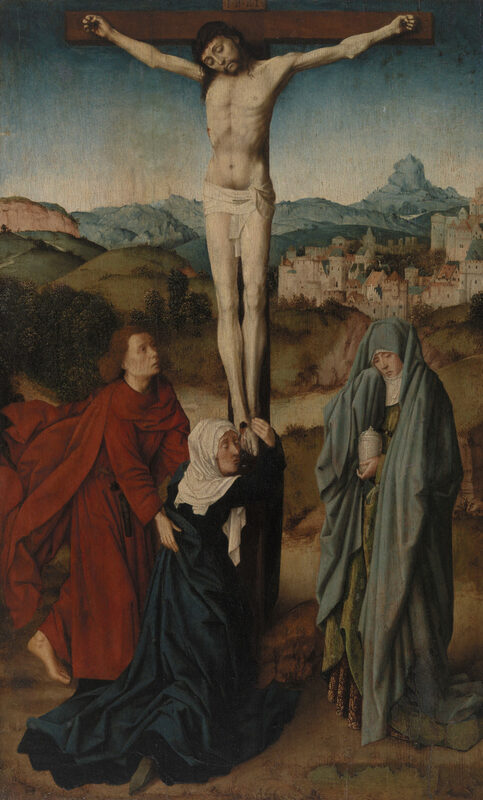 Crucifixion with the Virgin, Saint John, and the Magdalene, c. 1485. Oil on panel, Overall: 25 7/8 x 16 5/8 in. (65.7 x 42.2 cm). BF123. Public Domain.